Inspired by the civil rights movement, and a passion for design that empowers and serves people, Environmental Works has been practicing community design since 1970. Through community design, communities with limited resources collaborate in the planning, design, and development of their own communities. As an example of the community design process in action, we offer a case study of our Brighton Senior Apartments Project in Hillman City, Seattle (2016 – 2019). The Brighton in South Seattle, owned by Southeast Seattle Senior Foundation (SSSF), provides 124 affordable housing units to seniors with annual income up to 80% of the King County median, along with their relatives of any age. Recent senior immigrants from East Africa and Asia, as well as long-time residents of Central and South Seattle, comprise The Brighton’s robust, multi-generational community. Languages spoken by residents include Amharic, Somali, Oromo, Arabic, Tagalog, Vietnamese, Spanish, and English. SSSF received a grant for exterior improvements, presenting a unique opportunity for this diverse community to come together to create a shared vision for improved public space. In Spring 2016, Environmental Works met several times with a steering committee of Brighton residents, SSSF’s executive director and board members, and other community members to plan the community design process. 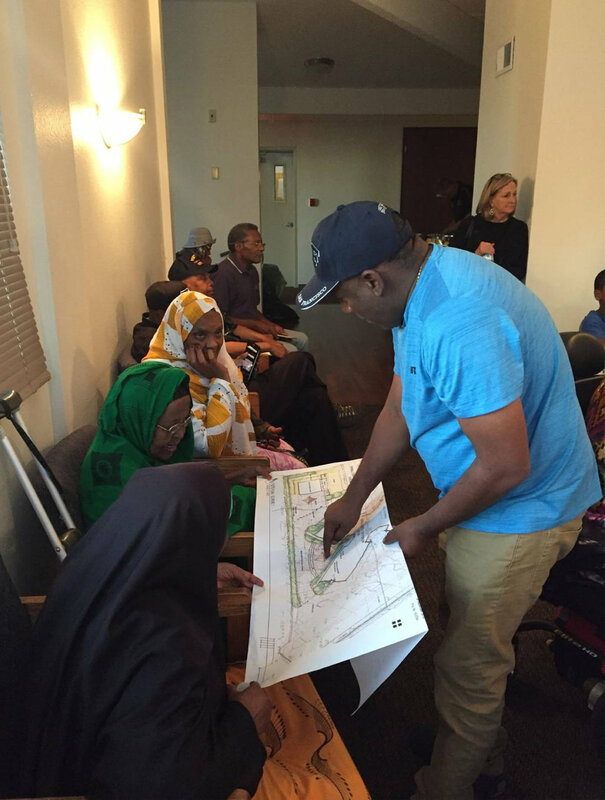 In May and June of 2016, EW held two visioning meetings open to all Brighton residents. Residents shared their best ideas for future upgrades to the Brighton campus. They also broke into small discussion groups to generate common themes of interest, which included accessibility, fitness, multi-purpose gathering spaces, barbecues/other food-gathering space, space for children, and landscaping. In July of 2016, EW facilitated a design meeting held in the existing outdoor gathering space to be redesigned. EW distributed a “kit of parts” it had created based on the prior workshops, so residents could test out various designs. The kit of parts included site plans; cut-outs of programmatic elements such as a covered barbecue area, a protected bike path, and fitness equipment; and markers. Participants refined their design ideas through a combination of small-group discussion, and listening to and sharing ideas with the larger group. At the September 2016 design meeting, EW presented three design schemes based on the residents’ ideas at the July meeting. Residents once again reviewed and discussed in small groups, and rejoined the larger group to share ideas. EW will use this input to further refine the schematic design drawings with options for the site. At future meetings, EW will present a refined design and offer another opportunity for community feedback. EW’s work with The Brighton is grounded in the “Pomegranate Process”, a holistic method for designing community space through meetings and collaborative design, which contributes to residents’ sense of ownership of the project. Sharing diverse viewpoints and expertise strengthens community while also giving rise to beautiful and effective design. Keep watching this space for updates on design and construction of The Brighton’s new outdoor spaces over the next few years. While we don’t yet know exactly how the finished spaces will look, we do know that the process of community design at The Brighton is bringing together scores of people, both young and old, from around Seattle and around the world, to collaborate on creating a shared vision for their community. Please visit our Projects page for photos and descriptions of completed projects, and our Testimonials page for more on how our community design work has successfully served and strengthened other communities. This 2011 Seattle Times profile of Environmental Works also discusses our community design process.